The Hubble image of the Ring Nebula [Messier 57, M57, NGC 6720] provides a wonderful example of the fluorescence produced by gases when they are irradiated with ultraviolet light. The colours in the image of M57 will be very familiar to anyone who watches the sky because the fluorescence originates from gases that are found in the Earth’s atmosphere: Helium, Hydrogen, Nitrogen, Oxygen and Sodium. At the core of the Ring Nebula is a pinprick of bright, white light. That’s a white dwarf, the leftover core of a star a little bigger than our sun that burnt out a few thousand years ago. As stars lose their reserves of hydrogen, their outer atmospheres puff out and escape into space. These still-expanding clouds of gas, now about a light-year across in the Ring’s case, form so-called planetary nebulae. 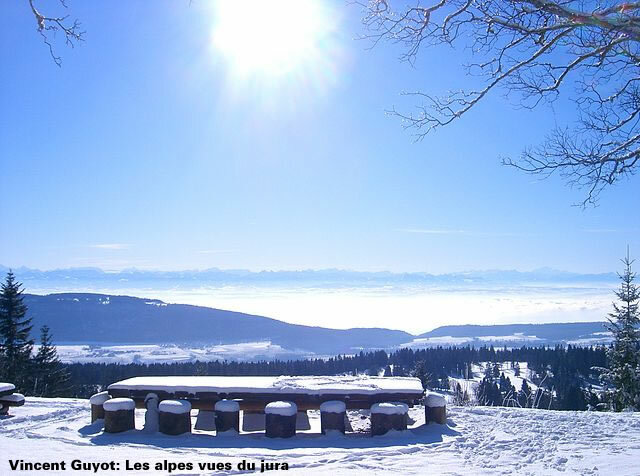 As they are irradiated by the white-hot white dwarf, the Ring’s clouds glow like a neon sign. In the image, the deep blue color in the nebula’s center is emitted from atoms of helium. The inner ring’s sea-green glow is produced by hydrogen and oxygen, while the red of the outer ring traces nitrogen. 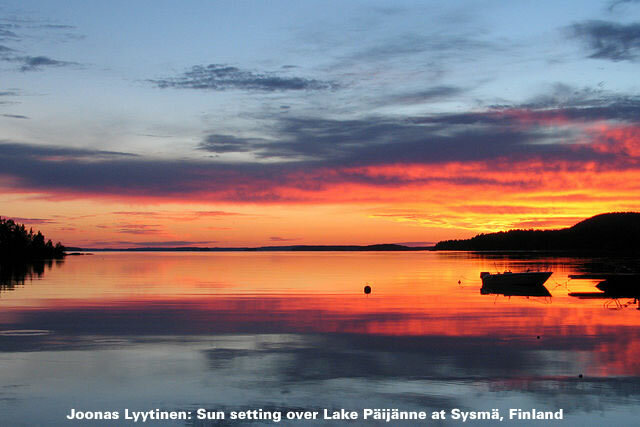 The darker orange comes from sulfur. 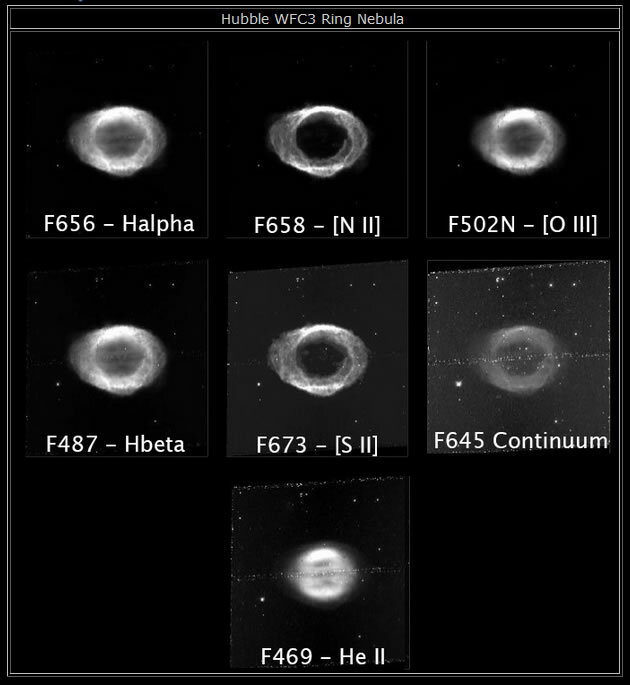 The M57 image is a composite image constructed from seven black & white images taken with different light filters targeted at specific emission bands. 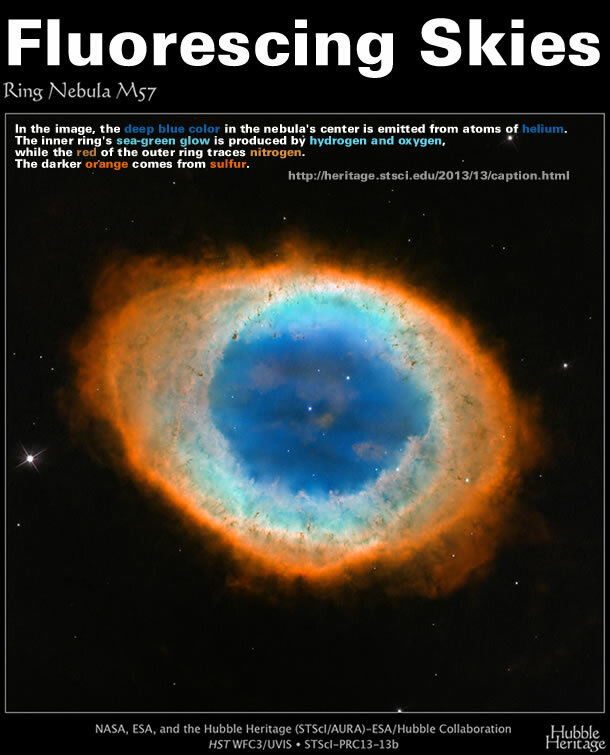 NASA also released a composite image of the Ring Nebula on the 23rd May 2013 that included false colour infrared data. NASA clearly indicates the M57 gas fluorescence is caused by ultraviolet star light. All of this gas was expelled by the central star about 4,000 years ago. The original star was several times more massive than our sun. After billions of years converting hydrogen to helium in its core, the star began to run out of fuel. It then ballooned in size, becoming a red giant. During this phase, the star shed its outer gaseous layers into space and began to collapse as fusion reactions began to die out. A gusher of ultraviolet light from the dying star energized the gas, making it glow. NASA very helpfully associates the colour banding with the gradual dissipation and absorption of the ultraviolet light as it spherically expands [away from the central star] into the gas cloud. This nebula’s simple, appearance is due to perspective: looking straight into a barrel-shaped cloud of gas shrugged off by a dying central star. Hot blue gas near the central star gives way to cooler green and yellow gas at greater distances with the coolest red gas along the outer boundary. Therefore, the M57 Nebula is different from Earth because the star is at the centre of the gas cloud. However, the similarities are striking because the Earth’s atmosphere displays a strong blue fluorescence when exposed to strong ultraviolet light from the Sun. Additionally, when the Sun is low in the sky [at sunrise and sunset] the increased depth of the atmosphere diminishes the strength of the ultraviolet and the lower levels of the sky frequently displays the familiar red, orange and yellow tones than can also be seen in the M57 Ring Nebula. The M57 Ring Nebula maybe 2,300 light-years from Earth but the physics governing gas fluorescence are the same in both locations. In 2013 the Hubble Heritage Project is slightly evasive and uses the word “irradiated” in association with the M57 gas fluorescence. 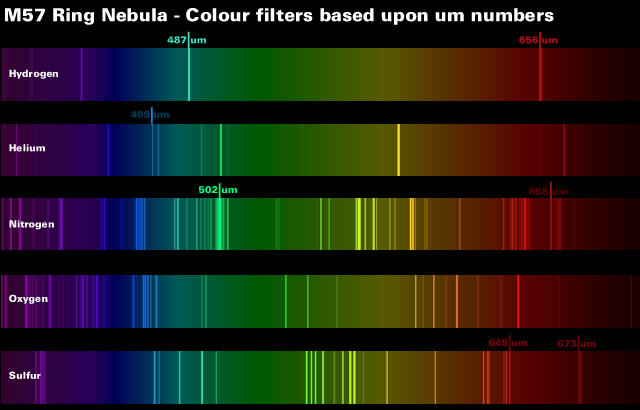 However, in 1999 the Hubble Heritage Project was more precise and clearly associated the M57 gas fluorescence with “ultraviolet radiation”. 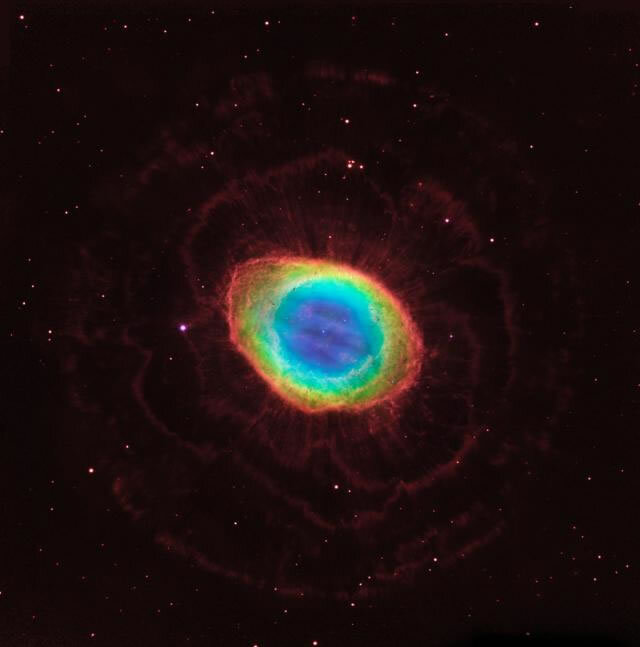 The Ring, first cataloged over 200 years ago by French astronomer Charles Messier and called M57, is the best-known example of a planetary nebula. It is a cloud of gas ejected from the doomed star at its center. The gradations of color illustrate how the gas glows because it is bathed in ultraviolet radiation from the remnant central star, whose surface temperature is a white-hot 120,000 C.
Gallery | This entry was posted in Astrophysics, Earth, Inventions and Deceptions, Moon, Science, Solar System. Bookmark the permalink.